Last week was a pretty normal week - nothing big to report on. 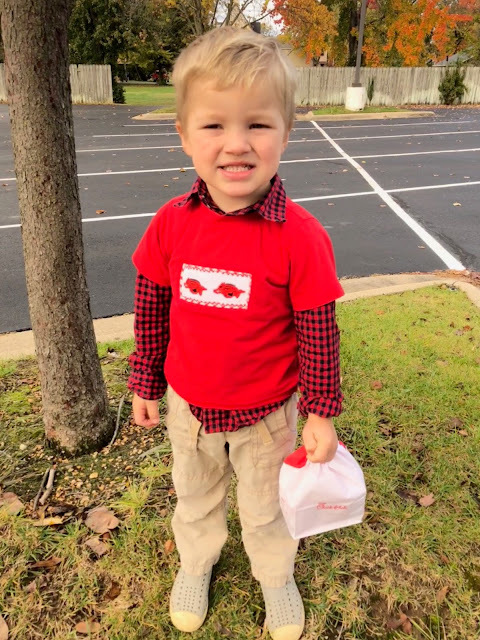 Will Holden and I headed to Bible Study on Tuesday and he charmed me into a little chickfila breakfast for himself. ha! It's hard to say no to that face. We had to go back to the ENT Tuesday to check on Harper's ears. Thankfully the drops she has been on are working so things are in MUCH better shape! Wednesday I took Will Holden to a park while the girls were in piano. This was our last pretty fall day. It turned bitter cold on Thursday and we are expecting snow today!! Which is bizarre in Arkansas in early November! Friday I ran by Home Goods and I found Laurie shopping. That was a pleasant surprise! It's a rare day to find Laurie in a hat and not perfectly coiffed. We made a super quick trip to Flippin Friday night and came back Saturday. It was freezing cold but the kids love playing outside at their house. They were playing in the leaves on Sat morning and it was 20 degrees outside. Will Holden is obsessed with riding a tractor when we go to his grandparents. He was ready to ride the minute we got there. He was up before the sun asking to ride the tractor but it was soooooo cold. He asked probably 456 times and we finally got him a ride and he was so happy. I asked him if it was everything he had dreamed of. ha! Nearly every time I go to my parents house, my eyes swell up. I have a bad allergy to something in the woods around their house I think. It started when I woke up Saturday and got worse and worse. Yesterday morning when I woke up - my eye was so big and swollen shut. I didn't think I could go to church butI put heat on it and then cold on it and took allergy pills and it got better. I don't know what it is with me and my face always having some kind of crazy swelling. ha! We taught Will Holden's class today. It was him and all girls which always makes me laugh. 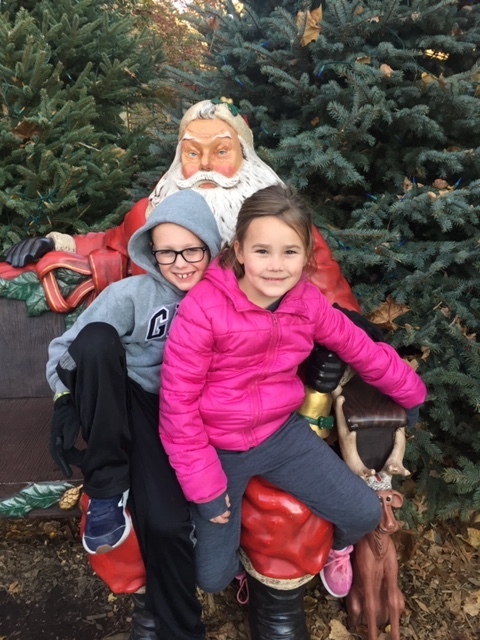 After church, Hollis went with her best buddy Joseph to Silver Dollar City. They said the park was nearly empty so they didn't have to wait on any rides. She could barely talk when she got home last night because she was so tired. That's just a small recap of what we have been up to.